Nemesis The Harris's hawk silently glides through the mists in search of prey for her chicks. As the mice have ranged farther out in the open in search of food, the neighborhood has become her favorite hunting ground. Snag is a cantankerous old Douglas Squirrel who lived deep in the woods until they became flooded. He was persuaded to move to The Refuge with the others, but keeps to himself in the trunk of a dead tree on the southern edge of the island. He is gruff and prefers his solitude, but when he sees a mouse fall out of the sky, he ventures out to help guide her to safety. Skoga is a large and ancient snapper turtle who has lived in the woods longer than any other living creature. He has no interest in the comparatively brief lives of others and wants to be left alone. He has lived in torpor in the stream for months as the cold weather has lingered on, and hates to be disturbed. Arken is the Master Engineer and Architect of the Beaver dam. His knowledge of dam building is unmatched among the beavers, but even he is hard pressed to meet his king's unreasonable demands. Privately, he questions the king's sanity, but he remains loyal and is determined to finish the dam, no matter the cost. Nyll is the leader of the mysterious ravens and head advisor to the king of the beavers. In return for food from the refugees' stores, the ravens act as the beavers’ eyes and ears in the forest and oversee the workers at the dam. Nyll is always in the presence of the king, and constantly complains of Arken's inability to finish the dam. Secretly, Nyll and the ravens serve the wolves and work to sabotage the dam in order to bring about the “Great Feast”, a feast of carrion at the end of time that will begin when the wolves take over the forest. Atlas is a great moose from another forest in the east. Not long after the humans left, his forest began to wither and the herds fell ill. Most of the surviving moose, deer and elk moved away to find food and escape the wolves, but only Atlas went west towards the city. He searches for a mysterious guardian who may be the key to saving the forest. The refugees were moved to a swampy island for protection by the beavers after their forest was flooded. They are kept there for protection against the wolves, who don't dare swim the frigid waters, but the refugees may have been better off fending for themselves and keeping the beavers away. Flik is a flying squirrel who hangs out with the forest mice, who she finds more friendly than the solitary tree squirrels. She has little to fear from wolves or other land predators, but takes pity on her earthbound friends, so she helps them out, acting as a lookout for any signs of trouble. She is always happy to help foil a wolf’s hunt, and is eager to help the mice fight back against their enemies. Gorgon is a Northern Water Snake who makes her home in a plastic kiddie pool discarded by the humans. The cold water makes her sluggish, but she is still more than capable of hunting anything that crosses her path. The ravens, who view the snake as their pet, occasionally drop hapless creatures into the snake’s lair as a form of deranged entertainment. The snake has no idea why these ravens do this and thinks they are fools, but she tolerates them as long as they drop off food. King Shonk is king of the beavers. Once a wise and able leader, since the disaster he has become ambitious and foul tempered. 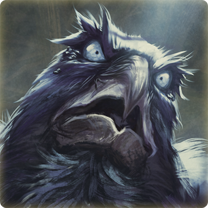 Some say he has gone mad in his old age, a fact that Nyll and the ravens have exploited to gain favor with him. Shonk obsesses about the dam and wants it built larger and larger, and will not tolerate any delays in his mad quest to have the largest dam ever built by beaver or man. 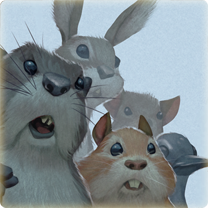 The refugees are a ragtag group of forest animals that were moved to a swampy island by the beavers after their forest was flooded. They are kept there for protection against the wolves, who won't dare swim across the frigid waters to get to them. but there is little food on the island and the water continues to rise. the refugees may have been better off fending for themselves and keeping the beavers away. Led by Erebus, a great wolf pack has invaded the woods from the east. They stayed away because of a powerful guardian that protected the woods, but in its absence, they are free to pillage the area, including the abandoned human neighborhoods. They now claim the entire land as their hunting ground, though the beaver lake keeps them from much of the forest and most of the surviving game. Erebus keeps the ravenous pack in line with promises of great hunting, but a lack of prey is forcing him to rely on brute force to stay in control. The wolves despise weakness, and any wolf that is too weak is ruthlessly turned on and killed by the rest of the pack. 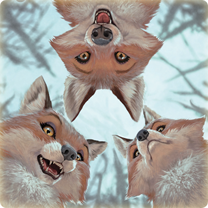 The witches are a strange trio of fox sisters who silently stalk the forest, making their presence known only when they choose. They manipulate certain events for reasons that are only known to them. For some strange reason they want to help Wix, but it’s unclear if they are just playing a game with him, or if they have other motives.